The #mprraccoon mugs for the camera outside a law firm on the 23rd floor. Then, it took a nap on the window sill. High above the bustling streets of St. Paul, Minn., among monoliths of concrete and glass, a daring climber has defied the odds — and the altitude — to capture a city's heart. It just happens that this little hero has paws. A raccoon had climbed since at least Monday, when it was spotted resting in a relatively low-level niche outside the Town Square building downtown, according to Minnesota Public Radio. The station says that after a failed rescue attempt, the animal scrambled onto a skyscraper nearby and continued its dangerous ascent. 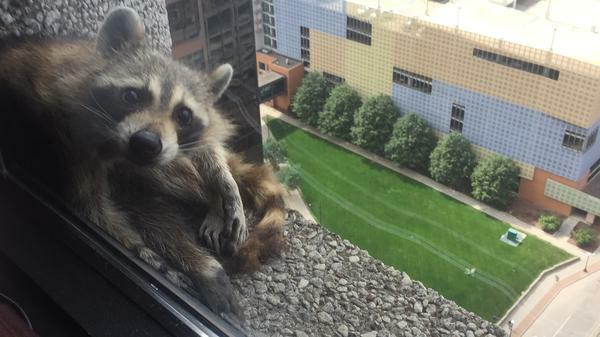 The raccoon was taken into custody overnight, MPR reported on Wednesday morning, citing word from a law firm whose office windows were graced by the animal, perched on a ledge. But its unlikely ascent continues to amaze. By Tuesday afternoon, the raccoon had climbed more than 20 stories outside the building of UBS bank — and had drawn a following so intensely invested in its journey, local media were even live-streaming the dramatic "RACCOON WATCH." Hours earlier, the MPR newsroom, which has had a front-row seat to the drama, mobilized to cover the epic — better known now as the tale of the #mprraccoon. The hashtag hit Twitter's trending list by Tuesday evening. Onlookers — both on Twitter and on the street — have struggled to cope with the frightening scene. Some grappled with their feelings in art. James Gunn, director of Guardians of the Galaxy and its sequel, which star their own kind of raccoon hero, offered "a thousand bucks to the non political charity of choice to anyone who saves this raccoon." "I just can't handle this," Gunn tweeted. "Poor dude." Even the raccoon itself weighed in with its regrets, though it remains unclear how the animal tweeted without opposable thumbs — or where, exactly, it's keeping its phone during the climb. For folks actually within the UBS building, such as attorney Sheila Donnelly-Coyne, the drama has been rather more immediate — and, well, in some ways less dramatic. The raccoon was perched for some time outside the 23rd-floor offices of her law firm, Paige Donnelly, and she told NPR that it actually looked pretty relaxed, all things considered. They were treated to a close-up view of some stretching, scratching and a fair share of napping. The office also had seen some firefighters filtering through. Donnelly-Coyne said authorities set up live traps on the roof, together with some cat food to entice the little one to climb just a few floors more. She says the firefighters told her office that other measures — such as reaching for the animal with window washing equipment — would very likely scare and "endanger the animal." So for now, the high drama has become a waiting game. Hang on tight, dear Spider-Raccoon. A city's hopes ride on your shoulders.